I am a Master Mason. How Can I Contribute a Paper? written by Master Masons of a Grand Lodge of Ancient, Accepted Free Masons. The first-known use of the word Freemasons - in the form Free Masons - occurs in City of London Letter-book H of 9 August 1376, though the word is in fact deleted in favour of Mason. Masons and Freemasons were interchangeable during the 15th and 16th centuries and Freemasons were generally meant to denote hewers or setters of freestone, Masons being used to embrace all stoneworkers. Ashmole in his diary wrote that he was made a Free Mason and referred in 1686 to the "Fellowship of Free Masons". James Anderson when writing his 1723 Constitutions did not use the single word - Freemasons - once. Whatever the reasons, the 1723 Constitutions contain approximately 126 references to Masons, 12 to Free Masons, 10 to Free and Accepted Masons, 9 to Free-Masons, one to Accepted Free Masons and none to Freemasons. And such is the tenacity of tradition that to this day the most of the Constitutions are addressed to Free and Accepted Masons and not to Accepted Freemasons. The earliest-known anti-masonic leaflet, of 1698, warns the public against "those called Free Masons" - almost certainly what we now know as speculative Freemasons. by RW Bro Yasha Beresiner LL.B. A Collection of Antique Masonic Engravings. Yasha Beresiner - Origins & Development of Royal Arch Masonry in England. This volume contains the earliest recorded account of accepted masonry and is considered the most implicit report on the fraternity available for the period at the end of the 17th century. It is printed in paragraphs 85 to 88 inclusive, on pages 316 to 318 of the tome. Masonic academic research today has reached a turning point. Carried on for decades by academics belonging to the Masonic order or philosophically near to it, Masonic scholarship continually sought out legitimacy from university and scholarly authorities. The research centres, chairs, seminars, and applications for high level international projects have multiplied, often with the support of Masonic Grand Lodges. In parallel, these obediences created, welcomed or financed their own research institutes or conference centres. They understand the importance of their heritage: archival materials, pictures and artefacts represented a powerful support for the organization, illustrated by the often remarkable public artistic exhibitions. However, the assessment remains mixed. Masonic studies remain isolated and still suffers from a recognition problem. It is therefore collectively that we need to think of the question of the bonds which still link Masonic research to the patronage of Grand Lodges and to all kind of Masonic institutions. There also exists an equally difficult second challenge: the ritual invocations to Georg Simmel or Jürgen Habermas aside, how can we integrate Masonic studies into research on public space, social networks and networking, history of ideas, studies of individual trajectories or of the birth of a political culture for Latin Masonry (what do you mean by "Latin"? Latin America? Not clear for English-speaking audience), without making lodges and their members a simple pretext, but by considering them as such and for themselves? The synchronicity of the universe is determined by certain mathematical constants which express themselves in the form of 'patterns' and 'cycles' in nature. Mathematical and geometric constants are confirmation that certain proportions are woven into the very fabric of nature. Recognising the significance of this simple fact offers us the means to understand how and why such matters were considered sacred. They and everything around us, are the product of the delicate balance between chaos and order. A collection of research papers by Bro. William Steve Burkle KT, 32°, Scioto Lodge No. 6, Chillicothe, G.L. of F.&A.M. of Ohio. 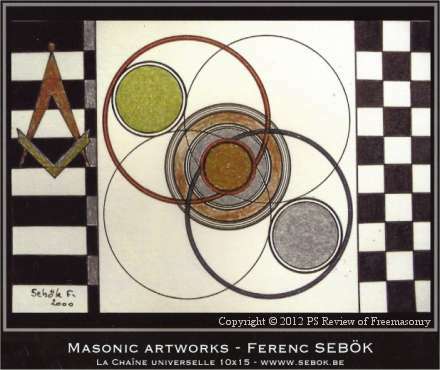 Collection of papers exploring the Masonic symbolism of King Solomon's Temple. References to the construction of King Solomon's temple at Jerusalem have been included in the rituals of the operative Freemasons since ancient times. In each of the several degrees of Freemasonry, the candidate Freemason progressively represents the various types of stone used in the building. Essays and Short Papers by W. Bro. Julian Rees, Masonic Author, PJGD of the UGLE. "Freemasonry teaches moral lessons and self-knowledge. Here Masons take their stand. From this point, we as Freemasons start our journey, our quest for self-knowledge, a path leading us to the inmost parts of ourselves, our own psyche and soul". D,G. Lecturer, G.L. of South Australia&N.T. Plato’s philosophy is at the core of modern Freemasonry. The Author provides evidence of the correspondences between Plato’s writings and our Emulation Ritual. A researched interpretation of Emulation Ritual Freemasonry from the perspective of Greek philosophy and mythology. The body of Freemasonry is comprised of many types of individuals whose Masonic pursuits vary according to that individual’s personality and interests. Freemasonry has been very aptly been compared to a complex tapestry composed of many colorful overlapping individual threads which taken as a whole form a larger picture. Brother Mason Pratt developed a list of different “Brands” of Freemasons based upon behavioral characteristics which included: “Socialite”, “Historian”, Ritualist”, “Philosopher”, “Masonic Law”, “Symbolism”, and “Collector”. I would add to this list the brands “Charitable” and “Fiduciary”. I suspect that most of us can think of Brothers in our own Lodge who fit one of these diverse profiles. Esoteric Freemasons usually fit into one or more of these “Brand” categories, although “Historian”, “Ritualist”, “Symbolism”, and “Philosopher” are the most common. Every initiated Freemason however is a potential Esoteric Mason, since all Freemasons seek illumination (light) through the initiation process. It is this quest for light revealed through the comprehension of hidden spiritual knowledge which distinguishes the Esoteric Freemason and defines Esoteric Masonry. Esoteric Freemasonry is not for everyone, not even for everyone who receives the gift of illumination. This is in no way a reflection upon the character or works of Masons who for various reasons find themselves disinclined to pursue the esoteric path. Unfortunately, there are many Masons who pronounce that there simply is no esoteric content at all to be had in Freemasonry, even though Masonic Ritual is ripe with evidence to the contrary. The purpose of this paper is to examine the causes of Islamic antipathy towards the Craft, locate them within an historical perspective, and discuss the surrounding issues. by Dr Andrew Prescott, Director of the University Research Centre University of Wales, Lampeter. by W.Bro. David Barrett, Grand Marshal of the G.L. of Israel. 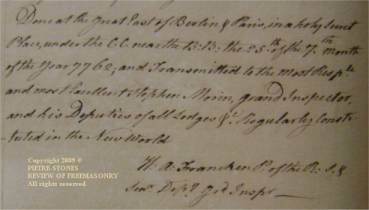 The independence of American Freemasonry -as that of the American colonies- established a pattern that has inspired many followers. by RW Bro. Leon Zeldis 33, Past Sovereign Grand Commander, Supreme Council of the AASR of the State of Israel. The Initiation in the craft degrees of the AASR is completely different from the ceremonies currently performed by most lodges in the English-speaking world. by W.Bro. Gary Kerkin, Grand Lecturer, the Supreme Grand Chapter of Royal Arch Masons of New Zealand. Ten lectures for presentation in a Lodge or Chapter for educational purposes. by W.Bro. Kent Henderson, PJGrand Deacon, A.F.& A. Masons of Victoria, Australia. The course is structured in three Sections, with four parts to each section. Papers of Hamill, Cryer, Henderson and others. For the Entered Apprentice, Fellow Craft and Master Mason. A look at the historical usage of the Double-Headed eagle and an examination of the underlying Alchemical and Hermetic symbolism. by Bro. Karel Musch, Middelpunt Lodge 280, Grand East of The Netherlands. In the XVIIIth century various Masonic Lodges were erected in Benedictine monasteries. Now keeping in mind the attitude of official Roman-Catholic Church towards Freemasonry this seems rather interesting. Click to read all the News. Freemasonry is one of the world's oldest secular fraternal societies. Freemasonry is a society of men concerned with moral and spiritual values. Freemasons are taught its precepts by a series of ritual dramas, which follow ancient forms, and use stonemasons' customs and tools as allegorical guides. The essential qualification to become Freemason is a belief in a Supreme Being. A Freemason's duty as a citizen must always prevail over any obligation to other Masons, and any attempt to shield Freemasons who as acted dishonourably or unlawfully, or to confer an unfair advantage on other Free Masons is contrary to this prime duty. The Freemasons refer to those who are not Freemasons as "cowans" because in architecture a cowan is someone apprenticed to bricklaying but not licenced to the trade of masonry. IS THERE A MASONIC MYTHOLOGY? THE "MASONIC" ONE DOLLAR: FACT OR FICTION? GOULD'S HISTORY OF FREEMASONRY THROUGHOUT THE WORLD by Robert Freke Gould. This edition in six volumes embraces not only an investigation of records of the organizations of the Freemasons in England, Scotland, Ireland, the former British Colonies, Europe, Asia, Africa and South America, but includes additional material especially prepared on Freemasonry in Europe, Asia and Africa also contributions by distinguished Freemasons covering each of the States and the District of Columbia of the United States, Canada and Latin America. Preston's work was exceptionally influential and was, together with the Book of Constitutions, one of the books owned by Freemasons in England. For the first time online on a Masonic site the "real" two volumes of such a basic work on Freemasonry by Mackey. Full text and images. The Book of Constitutions of the Antient Grand Lodge of England. A must to understand Masonry history. Found a lost copy of the Francken MS in Lahore, Pakistan. Currently this is the major masonic discovery of the 21th century. Freemasonry is an esoteric society only in that certain aspects are private; Freemasons state that Masonry is not, in the 21st century, a secret society but a "society with secrets". Some Freemasons describe Freemasonry as a "confidential" society in contrast to a secret society. Most modern Freemasons regard the traditional concern over secrecy as a demonstration of their ability to keep a promise and a concern over the privacy of their own affairs. Lodge meetings, like meetings of many other social and professional associations, are private occasions open only to members. The private aspects of modern Freemasonry deal with the modes of recognition amongst members and elements within the ritual. In reality, Freemasons are proud of their true heritage and happy to share it, offering spokesmen, briefings for the media, and providing talks to interested groups upon request. On this site curious non-masons can find out the real secret lives of the Freemasons as far as what are the secrets of Freemasons. visitors currently on the page | visitors today (GMT+1) | Total Visitors from January 1, 2005.